Flossing’s Benefits Are Being Questioned. Here’s Our Response. Until now most people would see their dentist every six months, get a checkup and cleaning and be asked… Do you floss regularly? Now patients will be asking their dentists, "Do I need to floss anymore?". In short… Yes!!! Flossing is important, I think if you ask your dentist 99.9% of the time the answer will be yes. 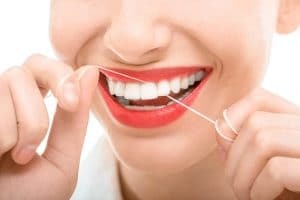 Even though the studies that have been conducted on the benefits of flossing are weak or too short in duration, evidence-based dentistry shows that flossing works. Lets think about it from an average person’s standpoint. Why do you brush your teeth? The answer is easy: To clean your teeth and prevent tooth decay. The issue is when you brush your teeth, the bristles of your tooth brush do not go between your teeth and clean the interproximal portions, and as a result we as dentists see a lot of patients that get interproximal (between your teeth) tooth decay. The only predictable way to clean between your teeth, besides going to the dentist for a cleaning, is flossing daily. Flossing also indirectly affects your bodily health. Studies have shown that people with periodontal disease have an increased risk of heart disease. Think of your mouth as the gateway to your body. Keep it clean and healthy and you increase the health of your entire body.